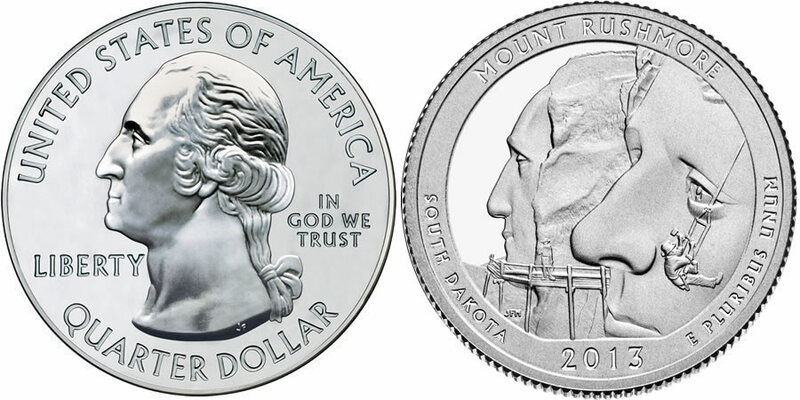 The 2013 Mount Rushmore Silver Uncirculated Coin. is issued by the United States Mint as the last of five 2013-dated strikes of the America the Beautiful Five Ounce Silver Uncirculated Coin™ series. A design found on the reverse of the strike is emblematic of Mount Rushmore National Memorial located in the Black Hills of South Dakota. Coins of this series are issued by the US Mint as the numismatic versions of the America the Beautiful Bullion Coins. Like those bullion coins, each of these are struck from five ounces of .999 fine silver to a diameter of three inches. To differentiate the two series, a 'P' mintmark is struck on the uncirculated coins indicating they were produced at the US Mint's facility in Philadelphia. The bullion coins are also struck in Philadelphia but contain no mintmark. In addition, these uncirculated coins are initially sold directly to the public by the US Mint whereas the bullion coins are sold through the Mint's network of authorized purchasers. Mount Rushmore National Memorial is located in the state of South Dakota. Construction on the sculpture began in 1927 and continued through 1941. It depicts the 60-foot likenesses of the faces of four past US Presidents - George Washington, Thomas Jefferson, Abraham Lincoln and Theodore Roosevelt. The obverse of the coin contains a portrait of George Washington, the first President of the United States. This portrait was originally created by John Flanagan for use on the 1932 circulating quarter dollar. Obverse inscriptions include UNITED STATES OF AMERICA, LIBERTY, IN GOD WE TRUST and QUARTER DOLLAR. Shown on the reverse of the strike is the design emblematic of Mount Rushmore National Memorial of South Dakota. Reverse inscriptions include MOUNT RUSHMORE, SOUTH DAKOTA, 2013 and E PLURIBUS UNUM. An edge inscription of "999 FINE SILVER 5.0 OUNCE" is used to indicate the coin's weight and fineness.